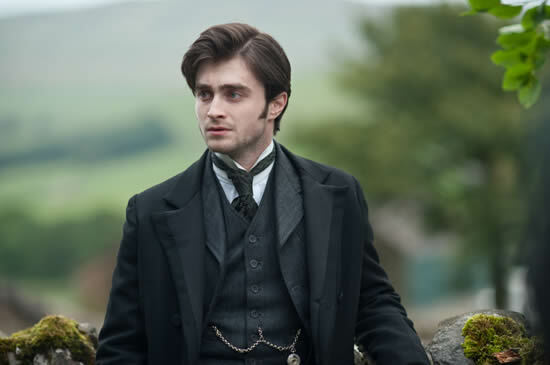 In The Woman in Black, Daniel Radcliffe may not have a megablockbuster on the scale of Harry Potter and the Deathly Hallows: Part 2 (or even the more modest Deathly Hallows: Part 1); even so, the period horror thriller starring Radcliffe in his very first post-Harry Potter role may well top the North American box office this Superbowl weekend. According to early, rough estimates found at Deadline.com, CBS Films' The Woman in Black may reach close to $20 million by Sunday evening after grosses of approximately $8.1 million at 2,855 theaters on Friday. The Woman in Black has a 68 percent approval rating among Rotten Tomatoes' top critics, with a 5.9 average. Those are hardly “wide acclaim” figures. Even so, the combination of the Radcliffe and a mysterious ghost have been luring the curious into movie theaters. Directed by James Watkins, The Woman in Black also features Janet McTeer (a Best Supporting Actress Oscar nominee for Albert Nobbs), Ciarán Hinds, Shaun Dooley, David Burke, and Liz White. Directed by Josh Trank, the sci-fi/fantasy/horror Chronicle features Dane DeHaan, Alex Russell, Michael B. Jordan, Michael Kelly, Ashley Hinshaw, and Bo Petersen. Chronicle has a surprisingly high Rotten Tomatoes' score: 85 percent among RT's top critics. Its average is a perfectly acceptable 7.2. Down about 52 percent at no. 3, the Liam Neeson adventure movie The Grey is expected to collect $9.4 million over the weekend after pulling in $3 million on Friday. The Grey was followed by new entry Big Miracle, which, despite generally good reviews (79 percent approval rating among Rotten Tomatoes' top critics) and the presence of The Office's John Krasinski and He's Just Not That into You's Drew Barrymore, opened weakly with only $2.2 million at 2,129 sites on Friday. Big Miracle, aimed at children and those who feel obligated to take them to movies (i.e., “families”), is expected to earn only $8 million for the weekend. The presence of marine mammals notwithstanding, Big Miracle will be no Free Willy. In Big Miracle, Ken Kwapis (He's Just Not That into You, several The Office episodes) directed an extensive cast that also includes Ted Danson, Tim Blake Nelson, Kathy Baker, Vinessa Shaw, Stephen Root, Dermot Mulroney, and, in a sort of cameo, the kiss of the death at the box office, Sarah Palin. So far, the fifth spot is up in the air. It'll go to either Kate Beckinsale's Underworld Awakening or Katherine Heigl's One for the Money. Each grossed an estimated $1.7-1.8 million on Friday. Their ranking will depend on how well they perform on the weekend proper. Deadline's estimates has Underworld Awakening ahead by more than $1 million by Sunday evening. The international box office, by the way, will not be affected by the Superbowl, as the vast majority of people outside North America couldn't care less about the Big Game – that is, if they've ever even heard of it. Daniel Radcliffe/The Woman in Black photo: CBS Films.